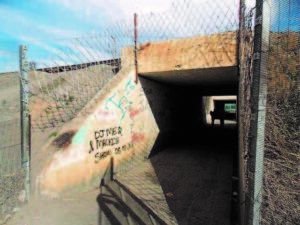 The notorious key tunnel in De Aar is being given a facelift in an effort to eliminate the numerous murders, assaults and robberies that have been taking place under the tunnel due to no lighting. Pedestrians will soon use the tunnel freely without fearing for their lives when they travel to and from the CBD to Sunrise, New Bright, Leeuwenshof, Montana, Kareeville and Extension 20, 14 and 10. These efforts are all thanks to a partnership between the Transnet Freight Rail (TFR) Agriculture and Bulk Business Unit and Solar Capital, who are still in the process of revamping the tunnel that connects the CBD to the different township points in De Aar. The process started as a Mandela Day initiative when the stakeholders cleaned and painted it. The public, TFR and Solar Capital came together with a total of 48 people participating in the first phase of the project. According to Transnet, the rate of criminal activity towards pedestrians has remained a concern among the community, as thugs have been using the tunnel as their hotspot for the past five years. Criminals are further accused of being the ones who went as far as breaking all the lights that were installed, making this a very dangerous area for every person entering the tunnel. Tracey-Leigh Matroos, TFR depot manager, who is also the one who came up with this idea and managed to get Solar Capital on board as one of the sponsors, said that the initiative was further an effort to clean up crime, promote unity and also ensure the well-being of the community that resides in De Aar. “This seemed like a brilliant idea to cost-effectively revamp and make the tunnel safe,” added Matroos. In an effort of showing appreciation and support towards the initiative, TFR and the public sponsored the base coat paint, reflective graffiti art and paint for the walls. Graffiti artists are expected to complete the painting with a reflective paint on the walls by the end of August. Installation of additional lighting in the tunnel is further expected to be completed in September. “This is truly a step in the right direction of Transnet, Solar Capital and the community to take hands and work together. Together we can move mountains in De Aar and keep our communities safe,” concluded Matroos.